Order the free Lean Production and Automation Insights Resource Kit to access valuable insights including case studies, technical papers, videos and more. Bosch Rexroth's VarioFlow plus conveyor is the easiest to assemble, quietest, most flexible and energy-efficient plastic chain conveyor available. It ships fast, too, and is now part of Rexroth's award-winning GoTo focused delivery program. 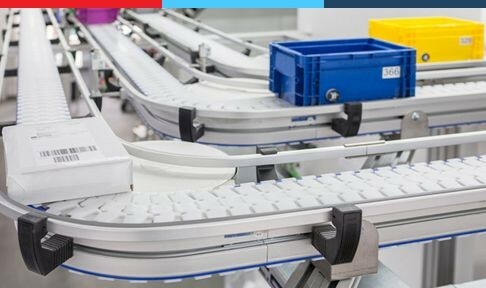 VarioFlow plus is a flexible, modular plastic chain conveyor system used for moving high volume packaged goods and other consumer goods, such as packaged foods, pharmaceuticals and healthcare products. It can be used to move products horizontally, vertically, on incline or decline, overhead, sub-floor, around obstacles and over long distances. Workpiece pallets can be used to convey products in applications where positioning or higher precision is needed.